"There’s been lots going on, we had the Mayoral elections, Crewe and Nantwich, Henley and the local elections to deal with, events come in and you have to react sometimes, in fact there are so many events to deal with it can be difficult to stay on track with the promises we’ve made but we’re managing it." Richard continues: "Michael still works full time as a consultant while balancing his responsibilities as CF Chairman. He brandishes his Blackberry, proudly boasting: "Yesterday I got 42 emails, 8 calls and had two meetings in my lunch break, it doesn’t stop and it’s not going to, there’s just too much to do."" Read the full ToryBear and Holloway interviews. What will the Party Board make of this? Now that a blog has run with part of the story I think that CF members unaware of the full story deserve to be told it. CF Diary can reveal that the Party's "Youth Development Manager" has approached long-standing activist and Castaway star Clare Hilley offering Party resources for a campaign to get her elected Chairman of CF instead of the other, long-standing candidates. I've been following this since before Christmas in the hope that the Manager would backtrack, apologise, or be disciplined internally. Instead, there has been continued deception on his part, and in the last week a Party Board investigation into the matter quietly concluded by telling him off for "the suggestion" that he had acted wrongly. In writing this report I've spent longer analysing the complexities of CF internal politics than I would usually care to, but it's important that it is made clear that this behaviour is absolutely unacceptable. In November, being completely new to the CF scene and having only been appointed around the time of Party Conference, the Manager asked a young CCHQ employee if they knew of any female activists who may be willing to run against Williams, Richardson and Rock. As a result the Manager met with Clare Hilley twice, talked regularly to her on the phone and on a few occasions exchanged emails with her (see below). He claimed to her that Justine Greening MP (who has some responsibility for CF), Caroline Spelman MP (Chairman of the Party), the Shadow Cabinet and even David Cameron weren't keen on the current candidates but were keen on getting a woman in the role. Hilley said she didn't think she had the time or money to organise a campaign, never mind having the time to be an effective Chairman. The Manager said that he could take care of the campaign and that unlike previous chairmen she could be more of a media spokesman than a director. He started to work on a website and other promotional materials, and even intended to use the CF Christmas Party to launch the campaign, even though candidates had (strangely) been told not to overtly campaign at it themselves. He also told her about the strength of different CF branches around the country and the details of meetings he had had with Mark Clarke and Justine Greening. After all this, the Manager told the democratically-elected Chairman of CF, Mark Clarke, that he didn't know who Clare Hilley was. Hilley initially thought about the idea before becoming concerned about the implications it would have for the relationship between CCHQ and the voluntary party, and realising that the Manager was clearly looking for somebody he could make decisions for. There is no question about Hilley's integrity here at all and she deserves to be re-elected Area Chairman of London South. I spoke to the Manager this morning to give him a heads-up on my intention to go public with this and to see if he happened to have any solid rebuttals. The only one he offered, other than it all being "rubbish", was that he only met Clare Hilley as a matter of course because she was standing for Area Chairman. This was back in November - four months before the election - and at a point when she wasn't intending to stand for AC. What was the "paper trail" he was so keen to avoid in November? What was the "leak" that he informed Hilley about in January? The current cost of youth membership of the Party is £5 for those under the age of 22, covering most students, and £25 thereafter. Sounds about right to me although I would raise the age to about 25 to cover all those students struggling with debt and rent whilst in their first job. Would be interesting to see if any CF candidates pledge to lobby the party into reforming the current system at all. "Young members are important to our Party, not only for their hard work with our campaign work on the ground but also to help shape our future plans. To help us recruit the next generation of Labour Party members we are introducing a new introductory £1 membership rate for all young people under the age of 27. I will be launching this new offer in December with representatives of Young Labour, Labour Students, young trade union members and Dawn Butler MP, Labour's Vice Chair for Young People. There will also be launches of our Young Members rate in every region, and in Scotland and Wales so that young people all over Britain know we are inviting them to join the party and help us shape the future." "Michael has a strong business and strategic management background having recently acted as an adviser to the Quality of Life Policy Group. He also has strong links with many Members of the shadow Bench and also brings a wide range of international experience having previously worked for the Australian Liberal Party. Michael will be heading up a team of two other people whose appointments will be announced shortly. This role is a revamped and enhanced National Organiser role, though with a greater strategic input." Michael will be at party conference so look out for him. Full details of CF events at party conference are copied below, I'd particularly recommend doing a stint on the social action project. A smart blog called Conservative Future for Britain has recently been launched, grandly describing itself as "the only campaign established to create a truly representative National Management Executive". Set up by members in Durham, Warwick and Birmingham, they are basically an internal pressure group that will endorse candidates in this autumn's CF elections that are seen be more representative of the nation than the current executive. At the time of writing its agenda has been endorsed by 24 parliamentary candidates and some MPs. The associated Facebook group - the hub of the campaign - has over two hundred members. The northern problem it is trying to address is part of a wider problem with the party in the north. A recent ICM poll confirmed a lot of anecdotal evidence in putting the Conservatives down to 26% in "the north", and most ambitious party activists are in London and the South East. A Northern Board and Shadow Minister for Cities scheme have been created to address this in the main party. I have a personal interest in this issue. After going to my first party conference as a lonesome "gritty northerner" I admit to almost never going back after the CF event, such was the difference in the background and perspective of most people there. Now I'm closer to being one of the ambitious political anoraks in Westminster that inevitably dominate CF. In its objectives CF4B doesn't go into detail about how it would achieve long-term balance in the organisation, it's not advocating changing the structure of the NME so that it is more like a Senate composed of one person from each region, for example, as has been suggested in the past. Looking at the debate on the Facebook group, however, it seems that they would advocate regionalising power in CF once their candidates are elected. That to me would be the strongest aspect of their platform. An argument often made on this site in different ways is that the party should "be the change" in more than its use of Fairtrade Tea, in this case in its advocacy of devolving power, diversity of its representatives etc. By devolving more resources and decision-making from the centre to Area Chairmen as people like Andrew Young and Nick Webb have long urged, the northern problem is diluted. As with ethnicity and gender, though, few members will cast their vote solely on the regional origin of the candidates. Their policies and ability are more important factors. The natural London CF clique can be hard to get around, but if there are enough members who care about regional representation then they will vote for it. All in all it's healthy to have this debate and shake things up a bit whilst we're effectively in an inter-regnum, as happened in the party's leadership election. In the age of the internet you can expect to see more and more micro campaigns popping up like this one. 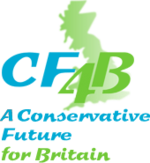 The main tangible thing that I think CF4B's general noise will achieve is boosting the importance of the northern factor in the minds of CF members when voting, and also raising the profile of the CF4B founders if they are planning on running themselves. Click continue to see the latest bulletin. It includes comments on the very commendable CF campaigning effort in the Ealing Southall by-election, a call for Area Chairmen to confirm they can still do their job, a call for writers for the official website, and details of several events. Sarah Southern, the part-time national organiser for a few years, resigned a couple of weeks ago and will eventually be replaced by two staff - one in HQ and one in the north, possibly the Salford regional campaign centre. Job descriptions and application details will be released soon. A lot of you have been wondering what happened to this year's elections that were due last month - they have now been postponed until an unspecified time in the Autumn (so the aswer to John Moorcraft's question in the previous post is Yes!). It was supposed to be a nine month term to move the dates to a more convenient time of year but will now likely be more than a year after the last elections which were in September 06. Mark Clarke won't be restanding as he was selected for the Tooting parliamentary seat a few months ago. There has been a complication in compiling the list of National Convention places relating to who is constitutionally eligible to be on it. It should be sorted out over the weekend and the names will be published with a couple of lines about each person. Chairman Mark Clarke is understandably busy with the Tooting parliamentary selection this week so his bi-monthly report for Nov/Dec is running late. The NME yesterday decided how to allocate Conservative Future's 42 National Convention Places. Places to all members of the National Management Executive. Places to our Honorary Vice Presidents and our President. One place to each of Conservative Way Forward, Tory Reform Group, Bow Group, Conservative Christian Fellowship, Conservative Home and the Conservative Friends of Israel. We believe that these organisations have worked especially hard for youth members in recent years. One place for each of our largest five University branches – Oxford, UCL, Leeds, Newcastle and Manchester. That leaves at least six places to be allocated to other people. We anticipate that actually the final total will be much higher because of the inability of some of the above to meet the criteria of guaranteed attendance. Early indications are that we should have around twelve more places available. Members are invited to put themselves forward for the remaining places. A brief paragraph outlining what they have accomplished for CF in the last three years should suffice. The NME will then make the final decision. If you would like to apply then please drop Ranil Jayawardena a line with your paragraph by 31st January. I had suggested publishing the final list with explanations for each person's appointment, this should be done by February 15th. The structured format and the recognition of the conservative movement are welcome improvements on previous methods. Paul will work with Rishi Saha on developing social action programmes at a CF branch level as well as running several larger projects. 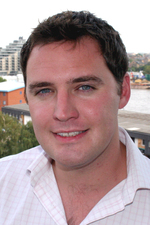 Dan will work with the CCHQ press team on getting good coverage in regional press. Justine Greening, one of the stars of the 2005 Parliamentary intake, has been busy in the media over the last day or two. Since becoming Vice Chairman of the Party with responsibility for Youth she has taken a very active interest in her brief, making CF a personal project of hers and representing its interests to CCHQ. Created the Freshers Fair packs (including personally designing the posters) which resulted in a 70% increase in membership this year. Worked with me on the proposals to the Party on future CF funding. Jointly presented with me to other Party donors to secure more funding for CF. Attended many CF events - Southamption Freshers Fair, Wirral West CF, Sheffield CF and UCL. She is also committed over the next 6 weeks to at least Aberwystith Uni and Lancaster Uni. She took the NME out for Christmas drinks. She has presented with me on the current activities of CF to Steve Hilton and to George Bridges at CCHQ. This was linked to the funding question. She meets with Sarah Southern and myself on a weekly basis to plan the work ahead. She came as a trainer on the CF women's training day and ran two sessions. She came on the Battersea campaigns day and trained people on running an election campaign. Expanded the role beyond merely CF to a general youth spokesman – witness today’s youth on youth crime stuff. I can reveal that James Dinsdale has this evening agreed to be co-opted to the CF Exec position of "Target seats: Branches". In effect he had already been pre-approved out of the original set of applications as someone the Exec would have liked to come aboard, as mentioned here, hence the rapidity in which he has been able to pick up were Greig Baker left off. James is current Area Chairman for Norfolk & Suffolk, and has already been involved in setting up the new branch in Harlow - where I understand he will be running a recruitment event next weekend. There had been some talk about whether Greig's brief co-option "used up" one of the three co-options the exec constitutionally allowed, but it seems to have been settled that this is not the case and the other two co-opted positions (Social Action and Media & Marketing) are expected to be finalised at the next Exec meeting. "The out of pocket cost has so far been £27,000. This has been spent on travel, hosting CF events which I have often subsidised myself , entertaining key party stakeholders, accommodation, offsetting the environmental cost of my travel through climate care, etc. 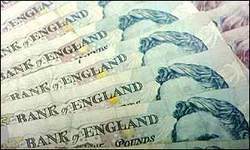 On top of this my loss of earnings has been £26,000. The total cost to me so far from being CF Chairman has, therefore, been £53,000. I have recieved no support from CCHQ, the State or any Party donors in this period. Alas, I have supported and borne the cost entirely myself." That's in just three and a half months. The most active members of previous year's execs have also reported excessive personal expenditure, especially on travel, and sometimes on things like leaflets and events. As an aside, some might argue that as a harsh reality elected CF Chairmen are likely to be those who spent the most money on their campaign for the Chairmanship (that's certainly the case in the last two years) and therefore should be willing and able to fund themselves to a degree once elected to the position. But even if this argument carried weight, there'd be no justification for entrenching a system that put money before merit, and the internet very much levels the playing field now anyway. Is your local association fit for purpose? Henry Edward-Bancroft, a Conservative Future member in Surrey, seeks your opinion on best practice. 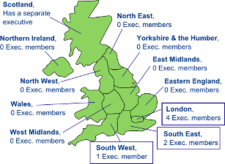 On January 1st dozens of new Conservative Associations were created across the country and it’s a good opportunity for Agents, Association Chairmen and anyone involved their local Conservative Association to re-think how they support and encourage younger members. It should go without saying that the future of the party depends on young members taking on positions of responsibility – where are the Association Officers of the future going to come from? In January I’m going to speak to my own Association about developing an approach to younger members based on good practice. We all know how important younger members of the party are, but we need some good ideas for Associations to put into practice. I’m keen to hear stories of good practice and perhaps some shocking examples of bad practice (no names of course)! Above all I’d like some innovative ideas and suggestions for involving our younger members in local Associations. Is there something local Associations can do to support younger members? Now’s the chance to have your say! Greig Baker - recently co-opted onto the exec to help Claire and Craig with the worthy task of building CF branches in marginal seats - resigned this evening citing personal difficulties with an elected exec member. I don't think it will be productive to dwell on the cause of the resignation, so please only comment wisely. I assume the process for co-option (much improved this year) will re-open for this position, unless it is decided to give it to James Dinsdale as runner-up the first time around. So in the meantime take a look at the role's description if you are considering offering your time and expertise. How should National Convention places be allocated? CF has 42 places on the National Convention (the 900-strong official voice of Party members to the Party leader). The allocation of these influential places has been an ambiguous business, is it time for a more formal process (as has now been instituted for Area Chairman and NME co-options)? Last year, the NME went for a pragmatic approach which was certainly an improvement on previous years. Each Exec member individually drew up a list of CF activists who they thought should be on it, and the most common names to come up got in. The two potential pitfalls of this method are "jobs for mates", and low turnout at Convention - whilst nominees accepted their roles they didn't actively apply for them initially. One simple solution that has been mooted is making the role ex-officio of being, say, an Area Chairman. Most ACs go to Party/Spring conference when the main meetings are held which is one advantage, but the numbers don't quite add up with there currently being 44 ACs, together with 9 NME members and a Chairman. The National Management Executive provides the core leadership for CF. The CF constitution allows for the co-option of three people to the Executive. The current team has identified a need to strengthen its team in three areas - Marginal Seats, Social Action and Media & Marketing. We intend to find this person in the most transparent and professional process, consistent with the fact that we see CF as an organisation which can make a meaningful contribution towards a Conservative victory at the next election. There are no pre-identified candidates or deals or promises made during the recent election campaign – this is genuinely an open process. And we hope it will draw out people who perhaps have not thought about heavy involvement before. We have written detailed job descriptions and application forms for each role. Applicants are invited to apply directly to me in the case of Social Action, and Media & Marketing and to Claire Palmer in the case of Marginal Seats. Again, consistent with our desire for greater professionalisation of CF, we have secured the support of a team of appropriate people will review all the applicants and recommend two or three candidates to the National Management Executive for a final decision (in line with the CF constitution). We have requested assistance from people who have expertise in this field and / or understand CF well. The new Deputy Chairman of CF will be announced tomorrow. As expected, it will be Claire Palmer (having been unanimously elected for the post by the rest of the Exec). Her main responsiblity will be the building of and enhancement of CF branches in marginal seats - Mark Clarke's main manifesto pledge. Half of all Exec time will be going into this initiative, which started with yesterday's training of Area Chairmen. There will be a second wave of ten later on in the year. In the meantime small existing branches in Wirral West, Loughborough and Torbay will be expanded. 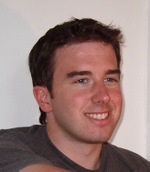 Ben Pickering was until February this year Director of the Young Britons’ Foundation. 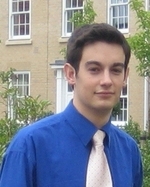 He has previously been Chairman of Wales Conservative Future, as well as holding office at Association and branch level. He is currently researching his PhD on EU eastward enlargement. Last week, as Tony Blair’s premiership was imploding on national television, I found myself thinking back to happier days for New Labour, and darker days for us. An annus horribilis. Ousted from office and reviled by electors. Not a pleasant time to be a Tory. When I joined the Party during the 1997 General Election, I wondered if I would be one of the last. Half the age of the next youngest member of my Association, I was encouraged to get involved with the Young Conservatives (YCs). In the 1950s, they had been hugely successful, but by 1997 their numbers were negligible. In addition, they had become a ragbag of Tory Boys (and Girls) in dinner suits and ball gowns, opining in Sloaney tones about ‘rugger’ and ‘fizz’ and all things ‘powsh’ down at the ‘Howse’. More “rah” than a Thundercats movie. Luckily I had joined at the tail-end of this organisation’s existence. I vividly remember my last experience of the YCs when, during the 1997 Conference, David Davies (now MP for Monmouth) cajoled me along to the last YC Ball. 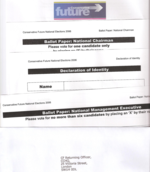 Many CFers received their ballot papers today. I thought it was good to see that unlike elections in the senior Party (e.g. leadership, National Convention), they didn't send out manifestos from all of the candidates - saving considerable expense. Voters are simply referred to the website, with the option of ringing up for paper copies of the manifestos (I'll write about the use of the net tomorrow soon). There was one arguable omission from the "pack" though - an actual explanation of the positions that candidates have been nominated for. If you are reading this, chances are you are fairly clued up and involved in the national scene - but you may well be in the minority. The manifestos themselves give the less engaged a good gist of the roles that are being contested, but perhaps next time a side of A4 should be provided that explains the structure of CF. Anyway, if you don't receive your forms within a week email [email protected] to see what the score is. Richard seems to have really helped get to grips with the electoral roll and ballot distribution, so we shouldn't see the mass disenfranchisement of last year - touch wood! The county email addresses for each area chair have always been sporadic in working. Yesterday I discovered that the addresses on the main Conservative Future website are still not working nearly seven months after it was first raised as an issue. This of course creates problems for NME candidates wishing to communicate with area chairs but my concern more importantly as an area chair – is how long this has been the case and the impression this gives to prospective members wanting to make contact? Central Office yesterday acknowledged there was a problem and were helpful in trying to find a solution apparently hotmail addresses are being set up for area chairs (I must of missed the email informing us of that – surprisingly!). However what kind of impression are we aiming to portray? The Conservative Party keeps no central database of members and therefore never knows how many members it has – this creates serious problems in terms of communication especially within conservative future with young members moving about for example between college and jobs. In summary we have a situation where CF does not know how many members they have and has no way for prospective and existing members to contact them. While the word ‘crisis’ is perhaps a little strong – the elected NME have a make or break year in terms of getting the CF house in order. A few people have been disqualified from the elections for late applications, including one Area Chairman application that was just under an hour past the deadline, and one - Owen Meredith's - that was sent three weeks before but must have been lost in the post. It is right that election rules are strict, bending any aspect of them undermines the process no matter how mitigating the circumstances are. Given that many AC's are automatically coronated for having no candidates, however, I'm sure the new NME will be happy to co-opt ACs who were the only ones who tried to apply initially. As an aside, the poor distribution of ballot papers last year was a major cause for concern, so hopefully lessons have learned. They are being sent out on Monday - if you don't receive one by the end of August please email the Returning Officer at [email protected].